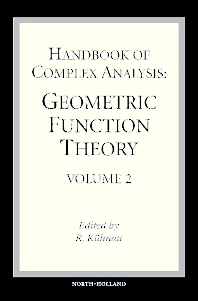 Geometric Function Theory is that part of Complex Analysis which covers the theory of conformal and quasiconformal mappings. Beginning with the classical Riemann mapping theorem, there is a lot of existence theorems for canonical conformal mappings. On the other side there is an extensive theory of qualitative properties of conformal and quasiconformal mappings, concerning mainly a prior estimates, so called distortion theorems (including the Bieberbach conjecture with the proof of the Branges). Here a starting point was the classical Scharz lemma, and then Koebe's distortion theorem. There are several connections to mathematical physics, because of the relations to potential theory (in the plane). The Handbook of Geometric Function Theory contains also an article about constructive methods and further a Bibliography including applications eg: to electroxtatic problems, heat conduction, potential flows (in the plane). · A collection of independent survey articles in the field of GeometricFunction Theory · Existence theorems and qualitative properties of conformal and quasiconformal mappings · A bibliography, including many hints to applications in electrostatics, heat conduction, potential flows (in the plane). Institutes of mathematics (and computer sciences). Institutes of physics and engineering. Preface (R. Kühnau). Quasiconformal mappings in euclidean space (F.W. Gehring). Variational principles in the theory of quasiconformal maps (S.L. Krushkal). The conformal module of quadrilaterals and of rings (R. Kühnau). Canonical conformal and quasiconformal mappings. Identities. Kernel functions (R. Kühnau). Univalent holomorphic functions with quasiconform extensions (variational approach) (S.L. Krushkal). Transfinite diameter, Chebyshev constant and capacity (S. Kirsch). Some special classes of conformal mappings (T.J. Suffridge). Univalence and zeros of complex polynomials (G. Schmieder). Methods for numerical conformal mapping (R. Wegmann). Univalent harmonic mappings in the plane (D. Bshouty, W. Hengartner). Quasiconformal extensions and reflections (S.L. Krushkal). Beltrami equation (U. Srebro, E. Yakubov). The applications of conformal maps in electrostatics (R. Kühnau). Special functions in Geometric Function Theory (S.-L. Qin, M. Vuorinen). Extremal functions in Geometric Function Theory. Special functions. Inequalities (R. Kühnau). Eigenvalue problems and conformal mapping (B. Dittmar). Foundations of quasiconformal mappings (C.A. Cazacu). Quasiconformal mappings in value-distribution theory (D. Drasin. A.A. Gol’dberg, P. Poggi-Corradini).